By MARTY JAMES Executive Sports Editor, Napa Valley Register September 29, 2008 Tom Zunino, Vacaville High School's longtime head football coach and athletic director who died Friday at the age of 71, was remembered locally by coaches as a great competitor who built a winning program and represented the Monticello Empire League administratively at the CIF Sac-Joaquin Section level. "The one thing that always struck me about Tom is he was probably the most honorable man I'd ever met in terms of his association with people," said Wayne Mills, a former Vacaville principal and Napa resident who for four years coached against Zunino when he was at Hogan-Vallejo. Zunino was also one of the most successful coaches in the area, compiling a .597 winning percentage (215-145-12) in 37 years as Vacaville's head coach. He had winning seasons in 26 of those years and the Bulldogs were Sac-Joaquin Section runner-ups in 1985, falling to Cordova-Rancho Cordova, 17-7. He was a Solano County and Northern California coaching legend, winning five Delta League and four Monticello Empire League titles. "Tom was fortunate enough to be able to do what he loved and enjoyed doing best and that was teaching, mentoring and coaching," said Napa's Angela Vidaurreta, a first cousin of Zunino's. "He was always ready and willing to lend a helping hand, whether it be to a family member or someone he just met, by giving advice, support or guidance. "He was always friendly and personable to everyone he met. No one was a stranger to him." Zunino came out of retirement and ran the Bulldogs' defense for his son-in-law, current head coach Mike Papadopoulos, and Vacaville won the Sac-Joaquin title in 2006, achieving a school-record 13-1 season. "He was just an icon in and around the league, the whole area," said Bob Herlocker, a Napa High assistant and former Indians' head coach who has also worked as an assistant at Vintage and Vallejo. "When you think of Vacaville football, the first thing you think about is Tom Zunino. "He was a fierce competitor naturally. His record speaks for itself. He put in a lot of years. He taught fundamental football. You know if you're going to be in a game with Vacaville, you were going to be in a dogfight literally. They always were well prepared and they always came to play. They were the type of team that you had to be ready for every year. You just always had to beat Vacaville if you had any thought of being the league champion." 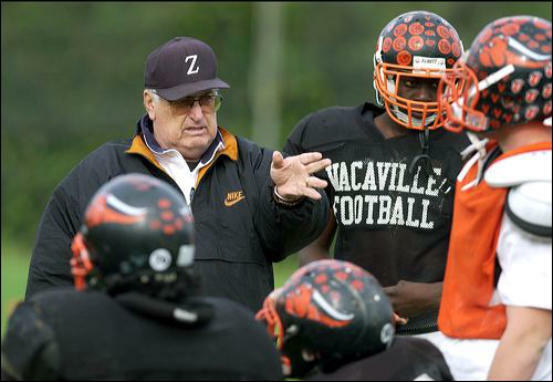 Zunino started out as Vacaville's head coach in 1961. Les Franco, a former Napa and Vintage head coach, remembers his teams engaging in great battles with the Bulldogs over the years. "I'll tell you, when you're on the field you locked horns," said Franco. "Every one of them was hard fought. I remember looking across the field sometimes and Tom was very excitable. You knew he was in the game all the time because he stood out on the opposite sideline." Zunino also had everything a head coach needed - administrative, booster club and fan support, said Franco, who met Zunino for the first time in 1970 at a Coach of the Year Clinic in San Francisco. "He got it started and built on it," said Franco. "You could tell he had a real connectionto Vacaville and that's where he was setting his roots down. You just had the feeling that he was going to be there a long time." He may have retired from teaching and stepped down as head coach, but Zunino never left the football program. He ran the defense under Fred Jones for a year, and was an assistant, helping out where ever it was needed. As its athletic director, Zunino oversaw interscholastic sports at Vacaville, with the Bulldogs winning Monticello Empire League "School of the Year" 14 times. Zunino's last year as Vacaville's head coach was 1997. Former Vintage coach Burl Autry, who founded the Crushers' program, said he had a great coaching relationship with Zunino. "He was probably the most aggressive coach that I've ever worked against, from one sideline to the other," Autry said Sunday. "I'll remember every time we played Tom it just seemed like it was always second guessing each other on almost every play - offense or defense. "Outside of the Vintage-Napa game, I think they were our biggest rival. For several years there, in the middle of my tenure of coaching, that game usually meant whether you went to the championship, or you went on or what. "Off the field and away from football, he was just a gentleman all the way." Autry said he and Zunino worked together for the MEL and attended athletic director's state conferences together. "It's been a great league. He was really pivotal to everything that was going on," said Franco. The 1973 Vaca team captured the Capital City Championship, beating Christian Brothers- Sacramento, 12-0. Zunino was a quarterback on Vallejo High's undefeated 1954 team and is in the Greater Vallejo Recreation District Sports Hall of Fame. He also played sports at Vallejo Junior College. The field at Vacaville is named after him. Zunino took time out of his schedule at Vacaville to work with Herlocker and the other quarterbacks at Hogan. "He came down and worked on our steps," Herlocker recalled. "He didn't have to do that. We were competitors with him, even back in those days in the nonleague schedule." Herlocker added: "I just remember him being so helpful to the league. He'll definitely be missed." The 2006 football season was history-making for Vacaville, which beat four straight opponents in the playoffs to win its first ever CIF Sac-Joaquin Section Division I title. Vacaville edged Merced 37-36 in the title game, completing a year in which the Bulldogs led the state in rushing and had the No. 3 offense in California. "Everything has to come together," Zunino said in an interview with the Napa Valley Register. "You have to have the players. You have to have the coaches. The big thing is, you have to have a lot of breaks and luck to go this far, and we were fortunate. We had some key guys that were hurt, but other guys stepped up to take their place." Zunino died of cancer after a lengthy illness. Funeral services are Saturday, Oct. 4, at 11 a.m., at St. Joseph Catholic Church, 1781 Marshall Road, in Vacaville. "Tom has always been a pillar of strength for our family," said Angela Vidaurreta, whose late husband, Al, was a former Napa and Hogan head football coach and administratorin the Napa Valley Unified School District. "I know he will always be loved and missed by all his family and friends. Tom loved his family."